Referring to the Westminster system of government, under which Trinidad and Tobago adheres, Dumas said Roberts should have resigned on at least one of its principles – ministerial responsibility. “The minister is ultimately responsible for his ministry. Even even if he does not know what is happening, he has to take some responsibility,” he said yesterday in a telephone interview. Roberts, who conceptualised the Life Sport in 2012, has said he would not sever ties with the Government following the release of the report into the programme. He said his name was never mentioned in the report. Prime Minister Kamla Persad-Bissessar, who terminated the Life Sport programme, has since forwarded the report to the Director of Public Prosecutions, Acting Police Commissioner Stephen Williams, the Integrity Commission and Head of the Public Service for possible criminal action. “Although he said, they had not mentioned his name in the report, all that is fluff,” Dumas said. “Anil Roberts should not wait to be fired. On the basis of the Westminster system we say we follow, he should submit his resignation. It is not a question of who stole money or who is corrupt. The minister is taking responsibility for what has happened in his ministry.” Meanwhile, the D’Abadie/O’Meara constituency of the People’s National Movement is calling on the Prime Minister to fire Roberts. 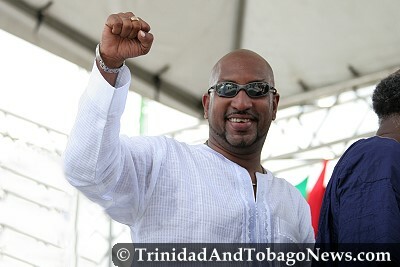 “We also call on Mr. Roberts to resign as the parliamentary representative of the D’Abadie/ O’Meara constituency, and save us from further ignominy and shame,” the constituency’s chairman Herman Noel said in a statement. Noel said in any democratic society which adheres to the rule of law and ethical principles, Roberts would have been immediately fired once the audit report was presented to the Prime Minister. “It baffles our reasoning that such action has not been taken,” he said. The G-Pan involves an increase in the range of musical notes possible on the traditional steelpan, while the PHI keyboard involves synthesising steelpan sounds with a range of sounds from other instruments through a digital mechanism on the pan. Both of these build on the conventional steelpan prototype. was spent on the invention. Oh! by the way, Ramlogan also claims that his favorite musical instrument is the tabla (and may have even suggested that it should be the musical instrument of Trinidad and Tobago). A former UWI St. Augustine Professor and the first local engineering lecturer with a Ph.D. He later became one of the youngest Deans in the Commonwealth and was appointed Professor and Head of the Department of Electrical Engineering in 1970, posts he held until retirement in 1996. Professor Julien also steered post-independence industrial development through his directorship of the National Energy Corporation, the Industrial Development Corporation of Trinidad and Tobago, and the Trinidad and Tobago Electricity Commission, among other state companies. He guided Trinidad and Tobago’s industrial thrust based on local energy, technological innovation and human capital. Through his chairmanship of Evolving TecKnologies and Enterprise Development Limited, the developer of the Wallerfield science and technology park; his presidency of the University of Trinidad and Tobago (UTT) and his leadership of Kenesjay Systems Limited, a consulting company specializing in energy. Ramlogan claims that money invested by the board of management at eTeck was badly invested, so he wants to recover the lost investment by suing professor Julien. is a beauty pageant titleholder who became the second Miss Universe in history from Trinidad and Tobago, she was the third woman of African heritage to capture the Miss Universe crown. Wendy was admitted to the bar in 2000. She was the Vice President of Investment Promotion at the Evolving TecKnologies and Enterprise Development Company Limited (E TecK), a state-owned company in Trinidad and Tobago. She was also appointed Ambassador of Youth for the Caribbean by the Red Cross and became the first time Red Cross appointee to this high honorary office. In this capacity she has been afforded the opportunity to address the World’s Youth globally. As a member of the board of Eteck, Ramlogan found that she is equally responsible for spending bad money in the investment. A graduate from Queen’s University, Mr. Jones left his distinctive mark on the energy sector of Trinidad and Tobago. From 1971 to 1975 he joined the Ministry of Petroleum and Mines where he acted in various capacities: Chemical Engineer, Development Engineer, Project Process Engineer, and Associate Project Manager. Fortified with such experiences, he became the president of Trinidad Nitrogen Company Limited in 1971 and served there until 1980. From 1981 to 1983 he was the head of the methanol and urea division of the National Energy Corporation of Trinidad and Tobago. Such was his ability that he became general manager (1984-88) and Managing Director from 1988 to 1996. In the latter capacity, he managed the total operations of the company which bought, transported and sold natural gas to the country’s power generation company, petrochemical companies, and other heavy and light manufacturing companies. It was of little wonder that Petrotrin also declared a profit of 1.3 billion dollars for the entire fiscal year 2006-07. It was quite an achievement for our petroleum company to post these figures without any sweat and with an understanding that the architect of this miracle would remain quietly in the background. His name would not even be mentioned for what has become a consistently superb performance. By his management performance Petrotrin posted record revenues compared to what we have today. Ramlogan, through his favorite legal luminary friend Gerald Ramdeen has alleged he breached his fiduciary duty as a director of Petrotrin in approving the payment of US$109,407,892 in cost overruns, so he is trying to recover that money. Since then we have seen mis-management scandals coming fast and furious from the present management of the Company. They caused millions in environmental damage. They caused scores of southerners to get sick. Acres of mangrove swamp are littered with crude oil because of them. Publicly humiliated by our erstwhile AG and accused him of stealing a piano (Wyrlitzer manufactured) after stepping down from office. The piano, probably valued at approximately forty or fifty thousand dollars TT. Through the work of Dr. Julien, hundreds of thousands T&T nationals and foreigner as well are gainfully employed in the energy sector today. Malcolm have shown the energy sector how to be profitable but in the eyes of this AG he is culpable and reckless by authorizing money to be spent on a project that lost money. Wendy, Oh what a gem and a first class product of our Country, she made us proud when she appeared before the world to show that not only she is representing Trinidad and Tobago with beauty and grace but she was also smart and articulate. Professor Copeland, you have made Pan a preferred musical instrument throughout the first world nations and now in all cultures. Pan is the newest musical invention and with your research prowess a much sweeter sound. By any standard all of these people mentioned performed iconic contributions with revenues to Trinidad and Tobago totaling billions of dollars, which people like Ramlogan himself is proud to show and boast about, but he has political calculations that, were he to defeat these mighty iconic giants, he stands to gain by belittling them. I mention these details to show that while this government is pre-occupied with ‘recovering wasted money’ from these prominent and heroic people, who have made invaluable contributions to the development of Trinidad and Tobago and thru their professional work have added so much to the Treasury, this AGt believes that he has the moral authority to be the person responsible for recovering money not well-spent from them. Ramlogan knows what he is doing, he does not necessarily have to get what he is seeking, but if by so doing he can cast enough shadow into the work of these people, he would be doing political damage to the past government and put any resurrection by the PNM to shame. There are so many financial improprieties and scandals committed by this government that the AG has not find it fit to even investigate any of them for criminal nor civil negligence. He also has not announced any interest in the prosecuting of the wrong doers of the FCB debacle, the Life Support debacle, the HCU debacle, the employment of unqualified personnel to run our institutions such as AA, CAL, T&TEC, UTT etc etc? If he is really serious in ‘recovering money’ he would go after them, but he is not. Our famously bribed $10M payoff finance minister, is never pro-active in these matters either, why? Our Prime Minister has either refused to or afraid to get rid of the sports minister in his handling of the Life Support fiasco which she famously pronounced “dead”, and without a word of impropriety on the part of her much maligned minister. Hundreds of millions spent and unaccounted for but our heroic AG is mum on that matter too. Running a government is not simply the management of money. Government is like the ultimate parent, responsible for ALL its citizens, it has a responsibility for our health, education, maintenance of our laws, keeping us safe from crime, safe from invasion, a responsibility to administer a fair and equitable justice system, maintenance of order and having general moral authority the we, as citizens can draw from. It therefore follows that if, by their behavior they appear inept, incompetent, corrupt, unfair in public dealings and show a general malaise, then with a perception like that they should be considered as such. You cannot convince me that you are fighting crime and we see criminal behavior coming from ministers of government. You cannot tell us that you are upholding the law when we see your ministers pulling at women breasts, beating up their girlfriends with behavior un-becoming. You cannot tell us that we must root out gangs when you have ministers meeting with prostitutes smoking ‘joints’ in hotels and boasting of how he can hold his liquor. You cannot lecture to us about honesty when we cannot trust you with how you spend money from our treasury. You cannot tell us about morality when you have shown none at all. You cannot tell us about public behavior when your cabinet is full with members who show no respect for themselves, the institutions they represent and the country that they are representing. Lastly, we have a country’s name to uphold, whilst it is true that we produce oil, gas, asphalt, methanol and other important minerals, our country’s name will best be served by how we conduct our selves, the image the rest of the world have of us and how we use our notoriety. If we are failing in these respects then there is nothing that we can proudly pass on to our coming generation because we MUST honor those who have made us proud, those who have fought for us to maintain our democracy and our good name. If you put a donkey as Minister, all he can is bray. You expect anything different. You think you can teach that donkey to do anything else but bray. I do like it when we in T&T could recite verse and chapter of the doctrine of other lands when we want something to go a particular way. However, when the talk reverts to the reality we change the topic. I agree that Mr. Roberts have many questions to answer but where is the Permanent Secretary?? What is the function of the Permanent Secretary?? The Permanent Secretary also has many questions to answer. In our modern society the functions of the Permanent Secretary must be redefined so that the ministries can function and when a payment like this is made under the instructions of the Minister then it is the minister that must take full responsibility. But enlighten me if I am going down a path that is fictional. If a large payment is to be made the PS would ensure that the contracts are signed by the relevant people and the oversight conditions are met before a check is cut. If a subsequent check is to be cut then the PS would make sure that the completition of the phases under the first check are met before a second check is made out. If that is true then the PS needs to be fired. He should have refused to be part of the operation. There should be the rule of collective responsibility with the Minister, Permanent Secretary and those working with the minister who have specific knowledge of the monetary abuse fired!!! It would be wrong to only get rid of the minister when the cancer runs deep into the system. It is like taking out a cancerous mole but leaving the cancer. Errol has negotiated some of the best collective bargaining contracts for these employees. They are paid to ensure the public trust is never betrayed. Failure means they must go….also. The recalcitrant minority that is our government should now resign. The Honourable Eric Williams warned us a long time ago about this recalcitrant minority who came of age in 2010. Of course they bribed their way with false papers every which way in our society from CJ, to doctor, to businessman, to drug dealer, to judge, to PM and the list goes on. And to add to the wound the cabal puts a crapaud PM who simply reads a scripted text to us every now and then. The Honourable Eric Williams also warned us about that. History does repeat itself. We now need to heed the lessons of time and move on to much greater things. Billy Preston once sang a song where he said “Nothing from nothing leaves nothing”. What we are witnessing is the echoes of nothingness which says “we are doing something”, when there really is nothing. Call elections NOW! what baffles is how this cabinet defended anil roberts after the two pull video surfaced,,,,they knew,,,the public knew and ray charles in his grave with his darkers on knew it was him,,,,his silly attitude and excuses was tolerated by his cabinet…colin partap was fired for a lesser offense..,,,jack warner the man who made this govt was kicked out…,,murders and safe houses happened because of this lifesport…the prime minister defended him to the end not that his seat was a sure seat to be won,,,he barely got there by 53 percent of votes in 2010…..,,,GOOD RIDDANCE…..